Known as the Holy Roman Empire of the German Nation from the late fifteenth century onwards, this was a mainly Germanic conglomeration of lands in Central Europe during the Middle Ages and the early modern period. Towards the end of the Empire, the advent of Protestantism as the dominant and often state religion across most of North Europe meant that the even the fiction of a single, unified Christian world was increasingly meaningless. However, at its most powerful, the Empire did represent recognition that temporal power is subject to God’s authority and that all power should be wielded morally and with integrity, not for personal gain and self-gratification. The Empire, for much of its history, can be seen as the Christian equivalent of the Muslim caliphate except that the Caliph combined political authority with the spiritual role of being the first amongst equals, while the Emperor was subject to the Pope’s authority . The Holy Roman Empire was a conscious attempt to resurrect the Western Roman Empire, considered to have ended with the abdication of Romulus Augustulus in 476. Although Pope Leo III crowned Charlemagne as Imperator Augustus on December 25, 800, and his son, Louis the Pious was also crowned as Emperor by the Pope, the Empire and the imperial office did not become formalized for some decades, due largely to the Frankish tendency to divide realms between heirs after a ruler’s death. It is notable that Louis first crowned himself in 814, upon his father’s death, but in 816, Pope Stephen V , who had succeeded Leo III, visited Rheims and again crowned Louis. By that act, the Emperor strengthened the papacy by recognizing the importance of the pope in imperial coronations. Contemporary terminology for the Empire varied greatly over the centuries. The term Roman Empirewas used in 1034 to denote the lands under Conrad II, and Holy Empire in 1157. The use of the term Roman Emperor to refer to Northern European rulers started earlier with Otto II (Emperor 973–983). Emperors from Charlemagne (c. 742 or 747 – 814) to Otto I the Great (Emperor 962–973) had simply used the phrase Imperator Augustus (“August Emperor”). The precise term Holy Roman Empire(German: Heiliges Römisches Reich dates from 1254; the final version Holy Roman Empire of the German Nation (German Heiliges Römisches Reich Deutscher Nation) appears in 1512, after several variations in the late 15th century. Contemporaries did not quite know how to describe this entity either. In his famous 1667 description De statu imperii Germanici, published under the alias Severinus de Monzambano, Samuel Pufendorf wrote: “Nihil ergo aliud restat, quam ut dicamus Germaniam esse irregulare aliquod corpus et monstro simile …” (“We are therefore left with calling Germany a body that conforms to no rule and resembles a monster”). In Faust I, in a scene written in 1775, the German author Goethe has one of the drinkers in Auerbach’s Cellar in Leipzig ask “Our Holy Roman Empire, lads, what still holds it together?” Goethe also has a longer, not very favourable essay about his personal experiences as a trainee at the Reichskammergericht in his autobiographical work Dichtung und Wahrheit. From the High Middle Ages onwards, the Reich was stamped by a coexistence of the Empire with the struggle of the dukes of the local territories to take power away from it. 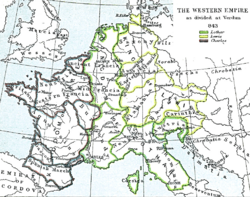 As opposed to the rulers of the West Frankish lands, which later became France, the Emperors never managed to gain much control over the lands that they formally owned. Instead, Emperors were forced to grant more and more powers to the individual dukes in their respective territories. This process began in the twelfth century and was more or less concluded with the 1648 Peace of Westphalia. Several attempts were made to reverse this degradation of the Reich’sformer glory, but failed. Formally, the Reich comprised the King, to be crowned Emperor by the pope (until 1508), on one side, and the Reichsstände(imperial estates) on the other. Becoming Emperor required becoming King of the Romans (Rex romanorum/römischer König) first. Kings had been elected since time immemorial: in the ninth century by the leaders of the five most important tribes: the Salian Franks of Lorraine, the Riparian Franks of Franconia, and the Saxons, Bavarians, and Swabians, later by the main lay and clerical dukes of the kingdom, finally only by the so-called Kurfürsten (electing dukes, electors). This college was formally established by a 1356 decree known as the Golden Bull. Initially, there were seven electors: the Count Palatine of the Rhine, the King of Bohemia, the Duke of Saxony, the Margrave of Brandenburg, and the Archbishops of Köln, Mainz, and Trier. During the Thirty Years’ War, the Duke of Bavaria was given the right to vote as the eighth elector. In order to be elected king, a candidate had to first win over the electors, usually with bribes or promises of land. The number of territories was amazingly large, rising to several hundred at the time of the Peace of Westphalia. Many of these comprised no more than a few square miles, so the Empire is aptly described as a “patchwork carpet” (Flickenteppich) by many (see Kleinstaaterei). For a list of Reichsstands in 1792, see List of Reichstag participants (1792). The Council of Imperial Cities, which included representatives from Imperial Cities grouped into two Colleges: Swabia and the Rhine. Each College had one collective vote. The Council of Imperial Cities was not fully equal to the others; it could not vote on several matters such as the admission of new territories. The representation of the Free Cities at the Reichstag had become common since the late Middle Ages. Nevertheless, their participation was formally acknowledged only as late as in 1648 with the peace of Westphalia ending the Thirty Years’ War. 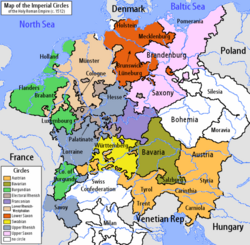 As part of the Reichsreform, six Imperial Circles were established in 1500 and extended to ten in 1512. These were regional groupings of most (though not all) of the various states of the Empire for the purposes of defense, imperial taxation, supervising of coining, peace keeping functions and public security. Each circle had its own Kreistag (“Circle Diet”). Heinrich designated his son Otto to be his successor, who was elected King in Aachen in 936. A marriage alliance with the widowed queen of Italy gave Otto control over that nation as well. His later crowning as Emperor Otto I (later called “the Great”) in 962 would mark an important step, since from then on the Empire – and not the West-Frankish kingdom that was the other remainder of the Frankish kingdoms – would have the blessing of the Pope. Otto had gained much of his power earlier, when, in 955, the Magyars were defeated in the Battle of Lechfeld. 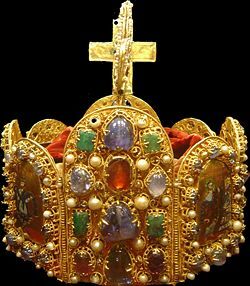 In contemporary and later writings, the crowning would be referred to as translatio imperii, the transfer of the Empire from the Romans to a new Empire. The German Emperors thus thought of themselves as being in direct succession of those of the Roman Empire; this is why they initially called themselves Augustus. Still, they did not call themselves “Roman” Emperors at first, probably in order not to provoke conflict with the Roman Emperor who still existed in Constantinople. The term imperator Romanorum only became common under Conrad II later. At this time, the eastern kingdom was not “German” but a “confederation” of the old Germanic tribes of the Bavarians, Alamanns, Franks and Saxons. The Empire as a political union probably only survived because of the strong personal influence of King Henry the Saxon and his son, Otto. Although formally elected by the leaders of the Germanic tribes, they were actually able to designate their successors. Already at this time the dualism between the “territories,” then those of the old tribes rooted in the Frankish lands, and the King/Emperor, became apparent. Each king preferred to spend most time in his own homelands; the Saxons, for example, spent much time in palatinates around the Harz mountains, among them Goslar. This practice had only changed under Otto III (king 983, Emperor 996–1002), who began to utilize bishopries all over the Empire as temporary seats of government. Also, his successors, Henry II, Conrad II, and Henry III, apparently managed to appoint the dukes of the territories. It is thus no coincidence that at this time, the terminology changes and the first occurrences of a regnum Teutonicum are found. 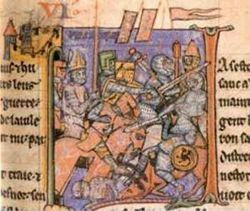 Conrad III came to the throne in 1138, being the first of the Hohenstaufen dynasty, which was about to restore the glory of the Empire even under the new conditions of the 1122 Concordat of Worms. It was Frederick I “Barbarossa” (king 1152, Emperor 1155–1190) who first called the Empire “holy,” with which he intended to address mainly law and legislation. Also, under Barbarossa, the idea of the “Romanness” of the Empire culminated again, which seemed to be an attempt to justify the Emperor’s power independently of the (now strengthened) Pope. An imperial assembly at the fields of Roncaglia in 1158 explicitly reclaimed imperial rights at the advice of quattuor doctores of the emerging judicial facility of the University of Bologna, citing phrases such as princeps legibus solutus (“the emperor [princeps] is not bound by law”) from the Digestae of the Corpus Juris Civilis. That the Roman laws were created for an entirely different system and didn’t fit the structure of the Empire was obviously secondary; the point here was that the court of the Emperor made an attempt to establish a legal constitution. Another important constitutional move at Roncaglia was the establishment of a new peace (Landfrieden) for all of the Empire, an attempt to (on the one hand) abolish private vendettas not only between the many local dukes, but on the other hand a means to tie the Emperor’s subordinates to a legal system of jurisdiction and public prosecution of criminal acts – a predecessor concept of “rule of law,” in modern terms, that was, at this time, not yet universally accepted. The later reign of the last Staufer Emperor, Frederick II, was in many ways different from that of earlier Emperors. Still a child, he first reigned in Sicily, while in Germany, Barbarossa’s second son Philip of Swabia and Henry the Lion’s son Otto IV competed with him for the title of “King of the Germans.” After finally having been crowned emperor in 1220, he risked conflict with the pope when he claimed power over Rome; astonishingly to many, he managed to claim Jerusalem in a Crusade in 1228 while still under the pope’s ban. During the long stays of the Hohenstaufen emperors (1138-1254) in Italy, the German princes became stronger and began a successful, mostly peaceful colonization of West Slavic lands, so that the empire’s influence increased to eventually include Pomerania and Silesia. The difficulties in electing the king eventually led to the emergence of a fixed college of electors, the Kurfürsten, whose composition and procedures were set forth in the Golden Bull of 1356. This development probably best symbolizes the emerging duality between Kaiser und Reich, emperor and realm, which were no longer considered identical. This is also revealed in the way the post-Staufen kings attempted to sustain their power. Earlier, the Empire’s strength (and finances) greatly relied on the Empire’s own lands, the so-called Reichsgut, which always belonged to the respective king (and included many Imperial Cities). After the thirteenth century, its relevance faded (even though some parts of it did remain until the Empire’s end in 1806). Instead, the Reichsgut was increasingly pawned to local dukes, sometimes to raise money for the Empire but, more frequently, to reward faithful duty or as an attempt to civilize stubborn dukes. The direct governance of the Reichsgut no longer matched the needs of either the king or the dukes. 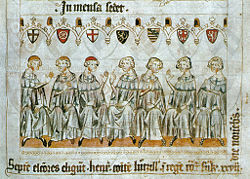 With Henry VII, the House of Luxembourg entered the stage. In 1312, he was crowned as the first Holy Roman Emperor since Frederick II. After him all kings and emperors relied on the lands of their own family (Hausmacht): Louis IV of Wittelsbach (king 1314, emperor 1328–1347) relied on his lands in Bavaria; Charles IV of Luxembourg, the grandson of Henry VII, drew strength from his own lands in Bohemia. Interestingly, it was thus increasingly in the king’s own interest to strengthen the power of the territories, since the king profited from such a benefit in his own lands as well. The thirteenth century also saw a general structural change in how land was administered. Instead of personal duties, money increasingly became the common means to represent economic value in agriculture. Peasants were increasingly required to pay tribute for their lands. The concept of “property” more and more replaced more ancient forms of jurisdiction, although they were still very much tied together. In the territories (not at the level of the Empire), power became increasingly bundled: Whoever owned the land had jurisdiction, from which other powers derived. It is important to note, however, that jurisdiction at this time did not include legislation, which virtually did not exist until well into the fifteenth century. Court practice heavily relied on traditional customs or rules described as customary. The “constitution” of the Empire was still largely unsettled at the beginning of the 15th century. Although some procedures and institutions had been fixed, for example by the Golden Bull of 1356, the rules of how the king, the electors, and the other dukes should cooperate in the Empire much depended on the personality of the respective king. It therefore proved somewhat fatal that Sigismund of Luxemburg (king 1410, emperor 1433–1437) and Frederick III of Habsburg (king 1440, emperor 1452–1493) neglected the old core lands of the empire and mostly resided in their own lands. Without the presence of the king, the old institution of the Hoftag, the assembly of the realm’s leading men, deteriorated. The Reichstag as a legislative organ of the Empire did not exist yet. Even worse, dukes often went into feuds against each other that, more often than not, escalated into local wars. With these drastic changes, much discussion emerged in the 15th century about the Empire itself. Rules from the past no longer adequately described the structure of the time, and a reinforcement of earlier Landfrieden was urgently called for. During this time, the concept of “reform” emerged, in the original sense of the Latin verb re-formare, to regain an earlier shape that had been lost. 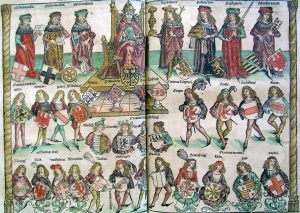 When Frederick III needed the dukes to finance war against Hungary in 1486 and at the same time had his son, later Maximilian I elected king, he was presented with the dukes’ united demand to participate in an Imperial Court. For the first time, the assembly of the electors and other dukes was now called Reichstag (to be joined by the Imperial Free Cities later). While Frederick refused, his more conciliatory son finally convened the Reichstag at Worms in 1495, after his father’s death in 1493. Here, the king and the dukes agreed on four bills, commonly referred to as the Reichsreform (Imperial Reform): a set of legal acts to give the disintegrating Empire back some structure. Among others, this act produced the Imperial Circle Estates and the Reichskammergericht (Imperial Chamber Court); structures that would — to a degree — persist until the end of the Empire in 1806. However, it took a few more decades until the new regulation was universally accepted and the new court began to actually function; only in 1512 would the Imperial Circles be finalized. The King also made sure that his own court, the Reichshofrat,continued to function in parallel to the Reichskammergericht. It is interesting to note that in this year, the Empire also received its new title, the Heiliges Römisches Reich Deutscher Nation (“Holy Roman Empire of the German Nation”). In 1517, Martin Luther initiated what would later be known as the Reformation. At this time, many local dukes saw a chance to oppose the hegemony of Emperor Charles V. The empire became then fatally divided along religious lines, with the North, the East, and many of the major cities—Strassburg, Frankfurt and Nuremberg—became Protestant while the southern and western regions largely remained Catholic. Religious conflicts were waged in various parts of Europe for a century, though in German regions there was relative quiet from the Peace of Augsburg in 1555 until the Defenestration of Prague in 1618. When Bohemians rebelled against the emperor, the immediate result was the series of conflicts known as the Thirty Years’ War (1618–1648), which devastated the Empire. Foreign powers, including France and Sweden intervened in the conflict and strengthened those fighting Imperial power, but they also seized considerable chunks of territory for themselves. The long conflict bled the Empire to such a degree that it would never recover its former strength. The actual end of the empire came in several steps. After the Peace of Westphalia in 1648, which gave the territories almost complete sovereignty, even allowing them to form independent alliances with other states, the Empire was only a mere conglomeration of largely independent states. By the rise of Louis XIV of France, the Holy Roman Empire as such had lost all power and clout in major European politics. The Habsburg emperors relied more on their role as Austrian archdukes than as emperors when challenged by Prussia, portions of which were part of the Empire. Throughout the eighteenth century, the Habsburgs were embroiled in various European conflicts. From 1792 onwards, revolutionary France was at war with various parts of the Empire intermittently. The Empire was formally dissolved on August 6, 1806 when the last Holy Roman Emperor Francis II (from 1804, Emperor Francis I of Austria) abdicated, following a military defeat by the French Army under Napoleon Bonaparte. Napoleon reorganized much of the empire into the Confederation of the Rhine. This ended the so-called First Reich. Francis II’s family continued to be called Austrian emperors until 1918. In fact, the Habsburg Emperors of Austria, however nostalgically and sentimentally, considered themselves, as the lawful heirs of the Holy Roman monarchs, to be themselves the final continuation of the Holy Roman Imperial line, their dynasty dying out with the ousting of Karl I in 1918 (reigned 1916-1918). 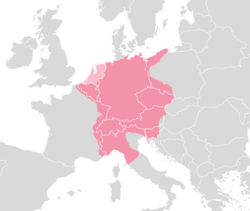 Germany itself would not become one unified state until 1871 after the Franco-Prussian War. In addition, at the time of the dissolution of the Austro-Hungarian Empire following the First World War, it was argued that Liechtenstein as a fief of the Holy Roman Empire (supposedly still incarnated in Liechtensteiner eyes at an abstract level in the person of the then-destitute Austro-Hungarian Emperor, despite its formal dissolution in 1806) was no longer bound to Austria, then emerging as an independent monarchy which did not consider itself as the legal successor to the Empire. Liechtenstein is thus the last independent state in Europe which can claim an element of continuity from the Holy Roman Empire. Whether the feudal system of the Reich, where the King formally was the top of the so-called “feudal pyramid,” was a cause of or a symptom of the Empire’s weakness is unclear. In any case, military obedience, which – according to Germanic tradition – was closely tied to the giving of land to tributaries, was always a problem: when the Reich had to go to war, decisions were slow and brittle. The term for the Empire, in other languages that historically were spoken within its confines are: Czech: Svatá říše římská,laterSvatá říše římská národa německého; Dutch: Heilige Roomse Rijk, later Heilige Roomse Rijk der Duitse Naties/Volkeren; French: Saint Empire Romain Germanique; Italian: Sacro Romano Impero; Slovene: Sveto rimsko cesarstvo, later Sveto rimsko cesarstvo nemške narodnosti. Angermeier, Heninz. Das Alte Reich in der deutschen Geschichte. Studien über Kontinuitäten und Zäsuren, München: Campus 1991. Bryce, James. The Holy Roman Empire New York, Schocken Books, 1967. Criswell, David. The Rise of the Holy Roman Empire. Charleston, SC: Fortress/Adonai Press, 2003. 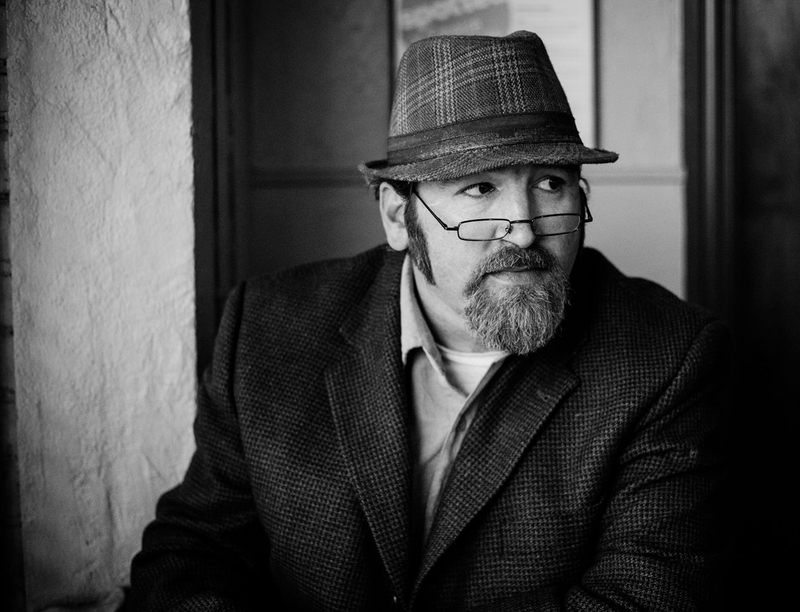 Hartmann, Peter Claus. Kulturgeschichte des Heiligen Römischen Reiches 1648 bis 1806. Wien: Böhlau, 2001. Heer, Friedrich. The Holy Roman Empire. New Haven, CT: Phoenix Press, 2002. Schmidt, Georg. Geschichte des Alten Reiches. München: C.H. Beck, 1999.
von Aretin, Karl Otmar Freiherr. Das Alte Reich 1648-1806. 4 vols. Stuttgart: Klett-Cotta, 1993-2000. Zophy, Jonathan W. (ed. 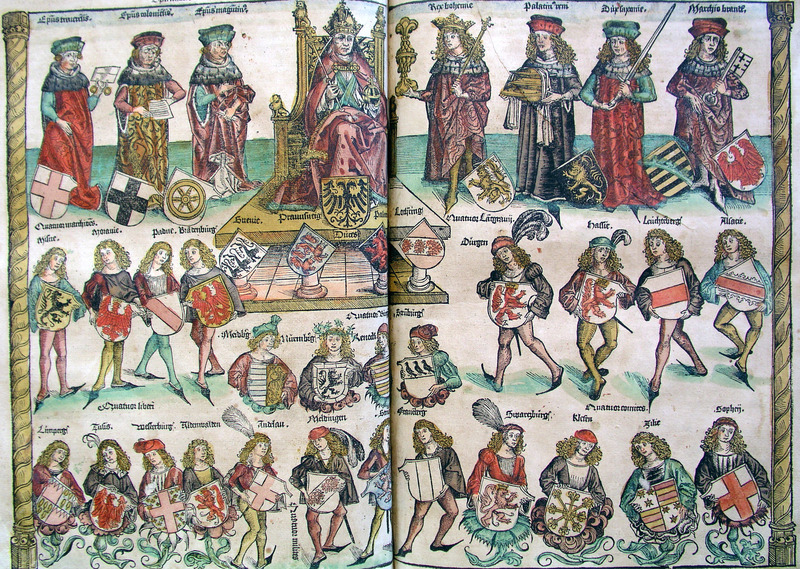 ), The Holy Roman Empire: A Dictionary Handbook. Westport, CT: Greenwood Press, 1980. This entry was posted in Germany, History, Holy Roman Empire, Medieval, Middle Ages. Bookmark the permalink.